Here is the rosette that Georgia Seitz challenged me to complete. My challenge was to tat the classic rosette but change the last two rounds to something of my own choosing. I did the fourth round with all half stitches, which are hard to see in this picture. The last round I did picot's ever two stitched. I am not real happy with the half stitch round as I didn't think it laid well. But I am still learning and will do better next time. 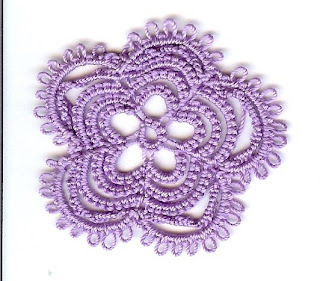 It is snowing outside so I am sure I will find time to do some more tatting. I am working on a bookmark for my sister for Christmas. It is made with cotton perle which I am not sure I like working with. I think it splits too easily and am not really happy with the final product.